Once you build a biquad you realize that it won’t stand on it’s own. The LMR-400 cable is very heavy and always pulls on your antenna causing it to face up. Using an antenna mount helps prevent this. It keeps the antenna locked in place and aids you in fine positioning the direction of the antenna. You can purchase an antenna mount or even a security camera mount. They will work great but they tend to be expensive. I used a combination of electrical and plumbing pieces to build this antenna support for under $8 U.S. [Fig. 1]. It works well as a table stand [Fig. 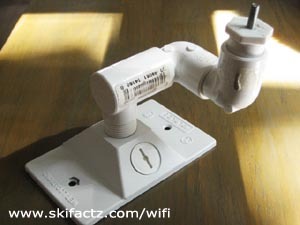 2] and it can also be wall mounted using the screw holes on the base plate. The range of articulation is far greater with this mount then with a typical security camera mount. You can really use your imagination in creating a functional mount. It is generally better to shy away from metal parts as they may reflect microwaves. 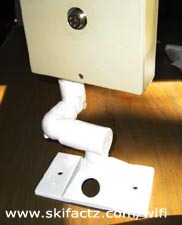 Plumbing PVC elbows [Fig. 3] are cheap and give you the ability to rotate pieces and position the antenna in many different ways.To attach the antenna drill a hole [Fig. 4] on the antenna housing and screw in the mount top. The ability to rotate the antenna is important for proper polarization. In simple terms you may get better signal by rotating your biquad 90 degrees to match the polarization of the access point’s antenna. This do-it-yourself antenna mount allows you to rotate the biquad and achieve just that. Once you mount the antenna you can use Netstumbler to set it up. 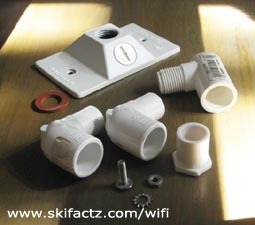 It’s a great tool for antenna installation and fine tuning.